TRANSMISSION: 6-SPEED AUTOMATIC 62TE (STD), RADIO: 430 NAV, QUICK ORDER PACKAGE 29N -inc: Engine: 3.6L V6 24V VVT FlexFuel, Transmission: 6-Speed Automatic 62TE, MANUFACTURER'S STATEMENT OF ORIGIN, ENGINE: 3.6L V6 24V VVT FLEXFUEL (STD), BLACK, LEATHER TRIMMED BUCKET SEATS, BLACK SIDE ROOF RAILS -inc: Integrated Roof Rail Crossbars, BLACK ONYX CRYSTAL PEARLCOAT, Wheels: 17" x 6.5" Aluminum, Wheels w/Machined w/Painted Accents Accents. 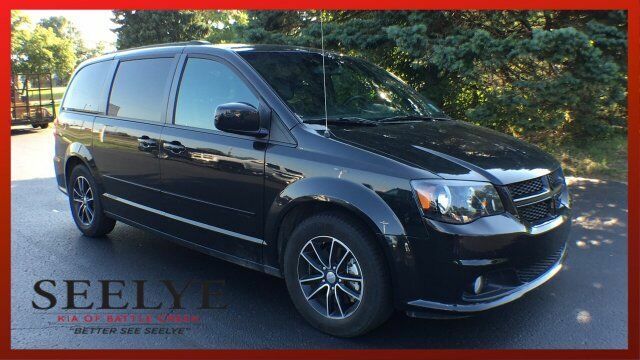 This Dodge Grand Caravan has a powerful Regular Unleaded V-6 3.6 L/220 engine powering this Automatic transmission. Variable Intermittent Wipers, Valet Function, Uconnect w/Bluetooth Wireless Phone Connectivity, Trunk/Hatch Auto-Latch, Trip Computer, Transmission w/Driver Selectable Mode, AUTOSTICK Sequential Shift Control and Oil Cooler, Towing w/Trailer Sway Control, Torsion Beam Rear Suspension w/Coil Springs, Tires: P225/65R17 BSW AS, Tailgate/Rear Door Lock Included w/Power Door Locks, Systems Monitor, Strut Front Suspension w/Coil Springs, Streaming Audio, Steel Spare Wheel, SiriusXM Travel Link (subscription required), SiriusXM Travel Link, Single Stainless Steel Exhaust, Side Impact Beams, Sentry Key Engine Immobilizer, Remote Releases -Inc: Power Cargo Access.